Novel proteasome regulation image by Sigi Benjamin-Hong, Strang Laboratory of Apoptosis and Cancer Biology. All cells recycle. 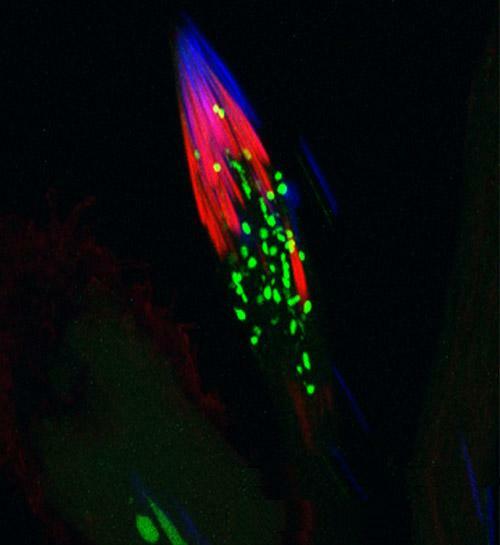 Here, we see actin filaments (red) direct unwanted (malformed, damaged, or toxic) proteins to proteasomes (green). In these barrel-shaped compartments, proteins are chopped up into their basic building blocks, called amino acids, and recycled to make new healthy proteins. You might wonder what this has to do with disease. Defective recycling is associated with diseases like cancer, neurodegenerative disorders, and muscle wasting. In some cancers—like multiple myeloma—the proteasomes are hyperactive, working overtime to dispose of an accumulation of unfolded proteins. Blocking this disposal system with proteasome inhibitors like bortezomib (Velcade®) puts the cancer cells in such a state of stress that they undergo apoptosis—basically committing suicide. Proteasome Regulation by ADP-Ribosylation. Cho-Park PF, Steller H. Cell. 2013 Apr 25;153(3):614-27. Recycling pathways are one phase of a larger protein folding management system- referred to as protein homeostasis or proteostasis (Science (2008) Balch, Dillin, Morimoto, Kelly). It not only includes the above mentioned components, but extensive protein folding components (chaperones including the ubiquitous and abundant Hsp70 and Hsp90 protein families) and signaling pathways (unfolded protein response (UPR), heat shock response (HSR), and antioxidant response pathways), among others, that generate and sense the status of the protein fold for function in response to the local environment. In addition to cancer, proteostasis pathways have a major impact on many different facets of human physiology and disease including aging, neurodegeneration, pulmonary pathophysiology (COPD, chronic bronchitus, emphysema,asthma, idiopathic disease), vasculature disorders (atherosclerosis), heart malfunction (coronary heart disease), liver dysfunction (metabolic syndrome/fatty liver/alcohol abuse), pancreatic (beta-cell) dysfunction (type II diabetes/obesity), muscle (muscle wasting and dystrophies), bone/cartilage disorders and immune disease- among many others. Proteostasis is also at the base of Rare Disease disorders. The rules governing the function and properties of proteostasis programs in each cell type remain largely to be defined in terms of maintaining a healthy proteome, identifying problem proteomes in response to inherited and environmental challenges and, of course, fixing the problem. Proteostasis is nature’s evolving way of solving protein function problems for survival and fitness (Nat Rev Mol Cell Biol (2013) Powers, Balch) and represents an untapped reservoir for drug discovery.